This week we celebrate the world of tiny and mini, featuring a Tudor Miniaturist, a baby sculpture in a hair, and mini adults reviewing mini works. Plus a mini review of a Masters Degree show. 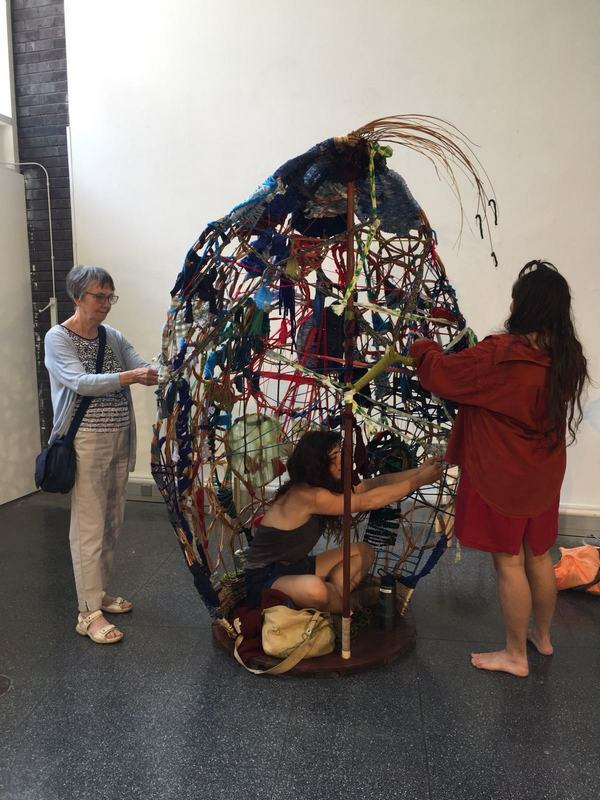 Recently we went to the Brighton UK Masters degree show. In this episode we talk briefly about some of our highlights. One piece featured a film giving information (in this case about statistics about slavery). There is a camera that checks to see you are watching the film. If you look away the video stops until you start watching it again. It is a clever way to get you to engage with the subject, requiring you to focus on the information on the screen. In another piece the viewer is confronted with 2 large sheets of paper hung and lit like they are ancient religious scrolls. They have faint writing on them and look quite beautiful. It is only when you investigate the writing further that you see they are lists of numbers that relate to the slave trade. It is a very moving and emotional piece. This work by this artist could be described at entertaining, thoughtful and playful, but with some serious art history knowledge behind it. One piece was a readymade chess board. 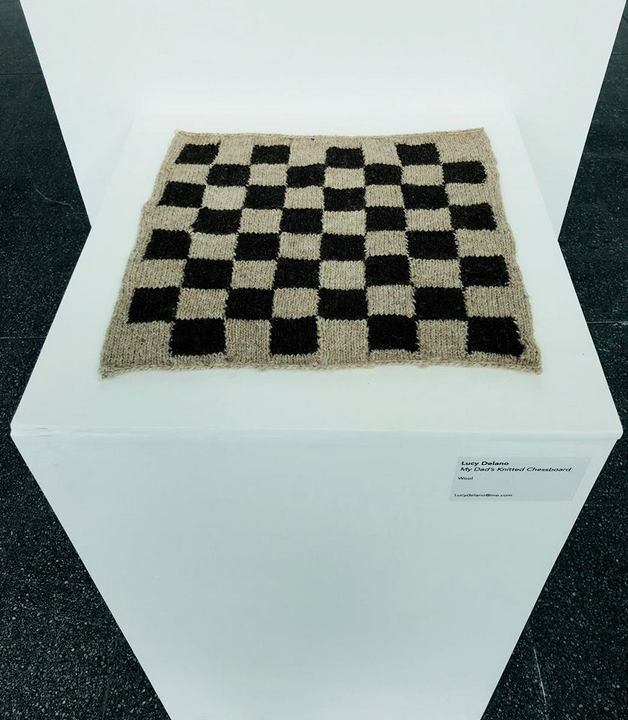 Called My Fathers knitted chess board. In fact made by the artists father , this piece references Duchamp. This artist’s work was a big cocoon like weaved form made of willow. Viewers are invited to add pieces of fabric. 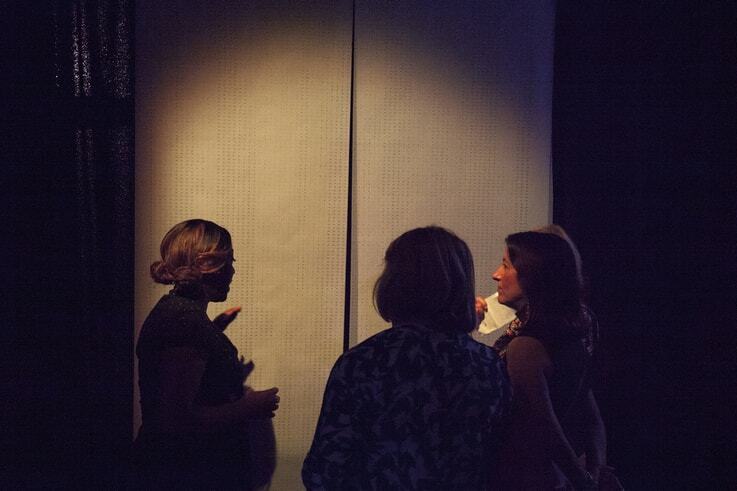 The research involved the local community working with fabrics and creating works. 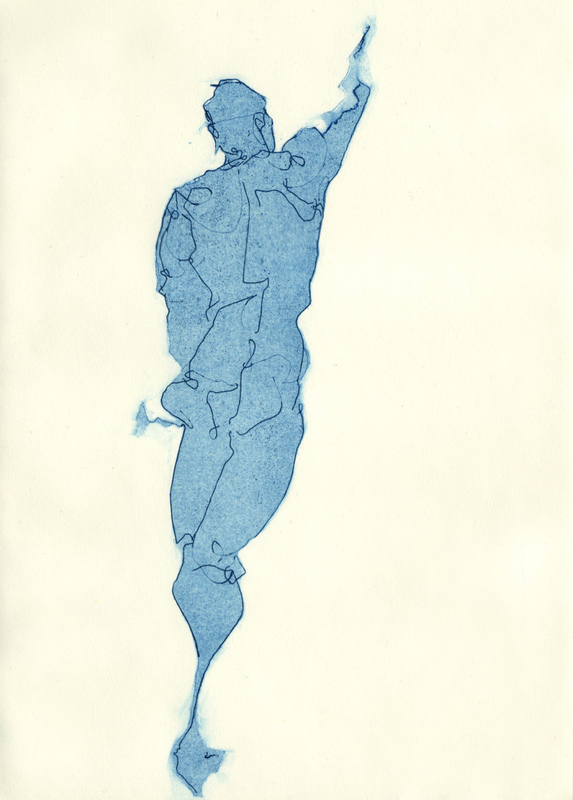 It is piece about community, sharing and the state of being in flow (in the moment). 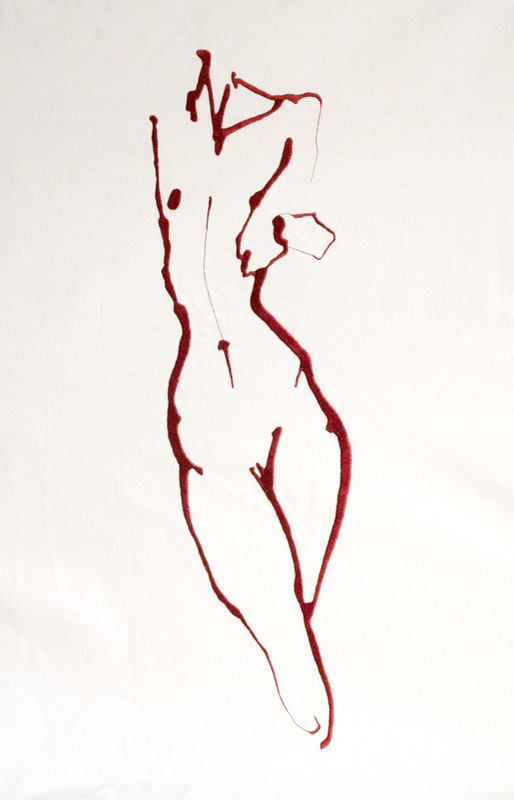 A interesting artist who’s work is delicate and fluid, the work involves a lot of life drawing, fabric and threads. 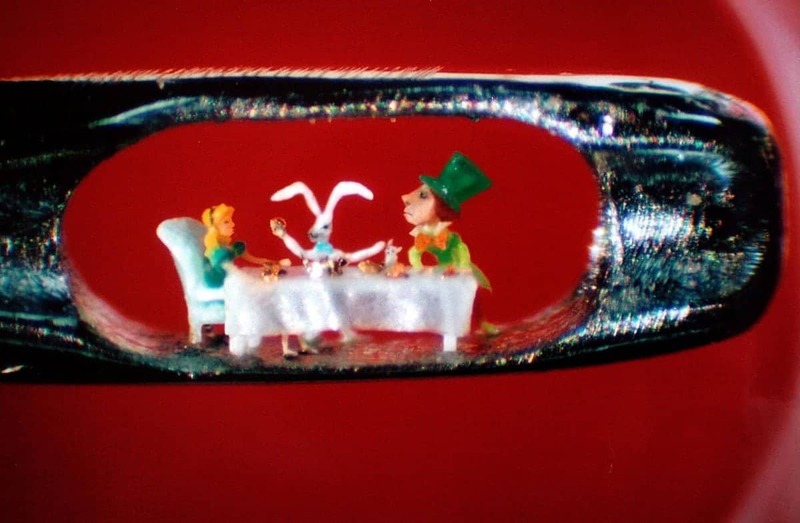 Willard Wigan is an artist who sculpts tiny works. 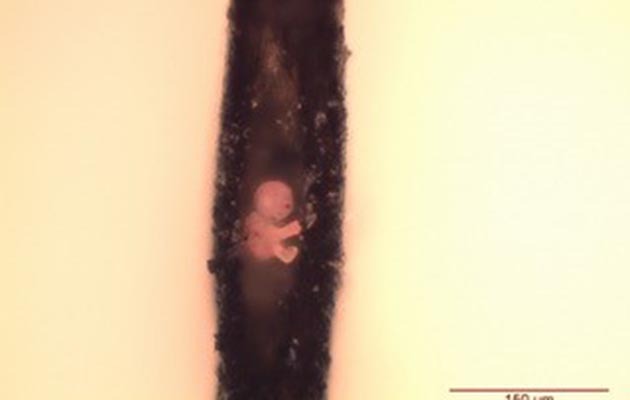 They are so small they fit on the head of a pin or in the eye of a needle. He makes tiny tools such as, tweezers made from eyelashes, a cutting tool that has diamond dust in the end of a hyperdermic needle. To sculpt works he has to hold his breath and work in between heart beats. 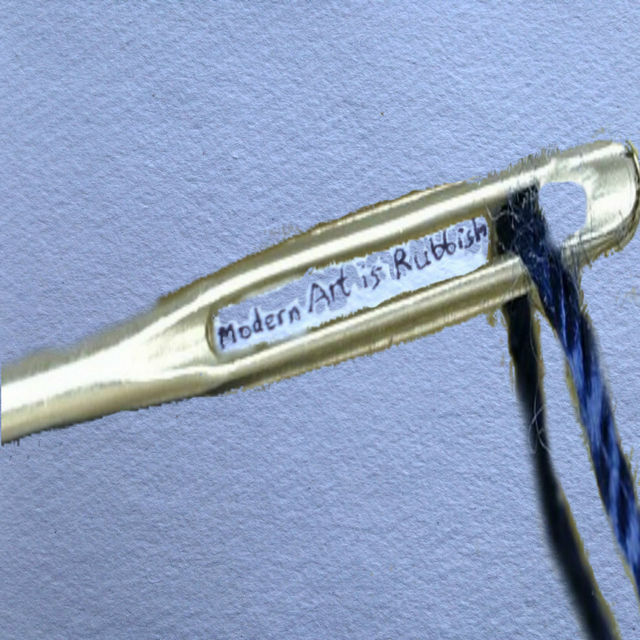 One of his works is a carpet fibre baby that fits inside a human hair. It is Smallest hand made sculpture in the world. The minature Artist duo talked with the show about the artists below. 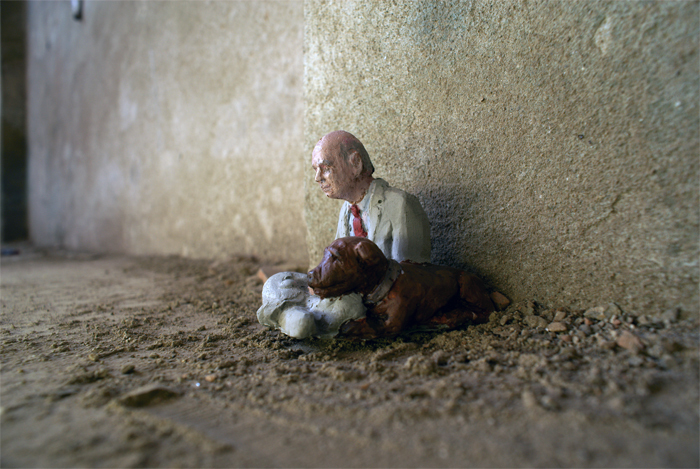 Isaac Cordal is a Spanish sculptor and photographer that makes little sculptures out of cement. The tiny sculptures depict the grey stressful routine driven modern life a lot of us experience. He calls these collective works Cement Eclipses. The first mentioned Cement Eclipse work is a very surreal image. 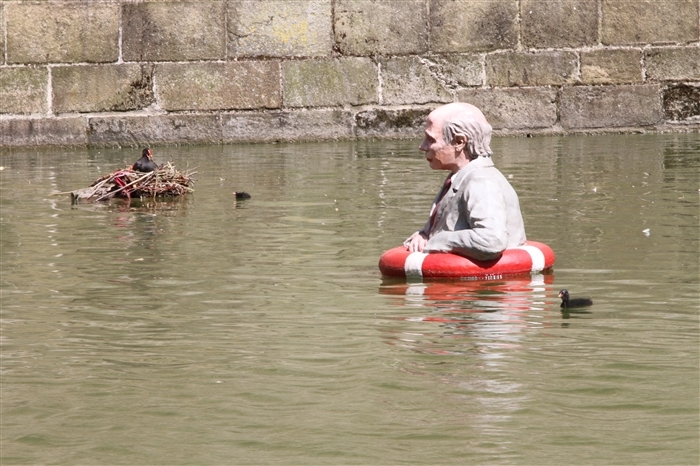 It contains several tiny bald men in grey suits, they are semi-submerged in a deep puddle in-front of a pavement’s curb. They are all looking concerned, as one man lifts off the top off one mans head, to reveal nothing inside. In another work a man in a suit is lying face down on the ground. It looks like he has been flushed with the rain water out of an overflow pipe. In a third work a balding man in a grey suit sits down cross legged, with his dog beside him. In final discussed work Waiting for Climate Change a man in suit is floating in a pool with a red rubber ring around his waste. Also 2 other men struggle to just keep there head above water. Watching this scene are nesting and swimming ducks. A video feature his works…..
British photographer. 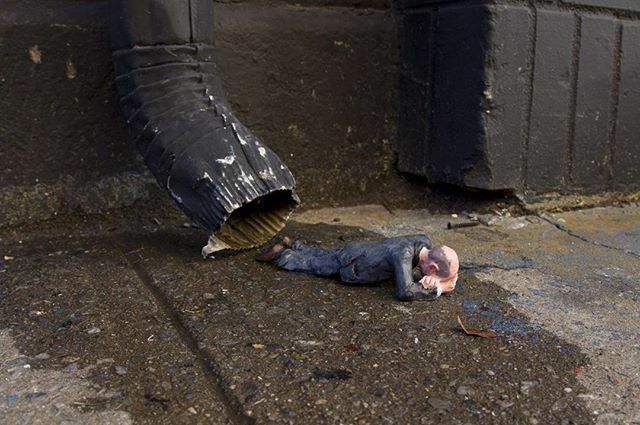 He makes tiny scenes with little people, inserted into outdoor urban settings. In the first work discussed a trainer lies on its side in a puddle, it’s lace has been arranged to look like a florescent green sea serpent. The small figure of a ship’s captain and a boy are floating on a bottle top nearby, whilst they look on. 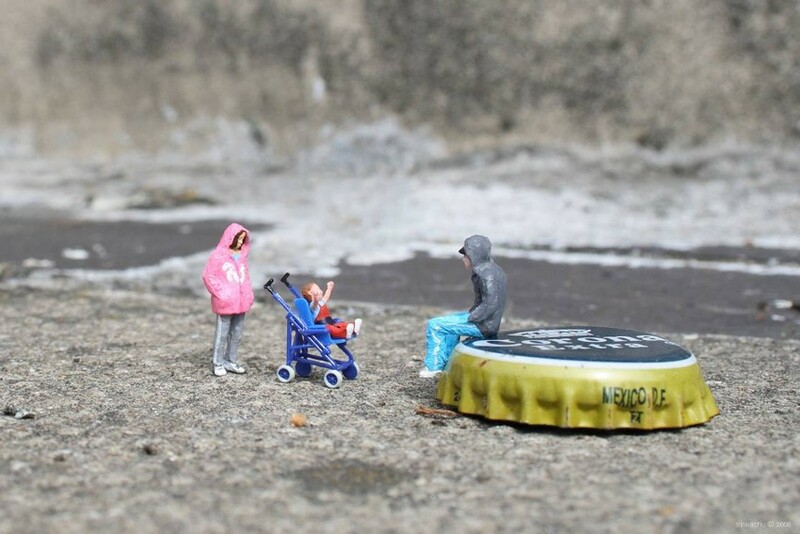 The third discussed work features a hooded teenager a sits on top of a bottle top looking a toddler in a pram, what looks to be his young partner and child’s mother in a pink jacket is standing looking at the child also. 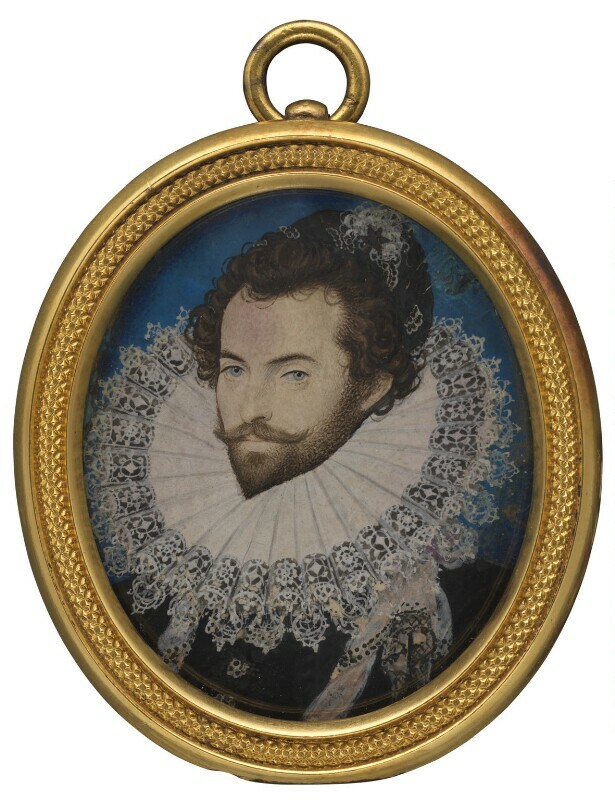 Nicolas Hilliard Was a Miniaturist who painted many noble and well know people from the Tudor period. 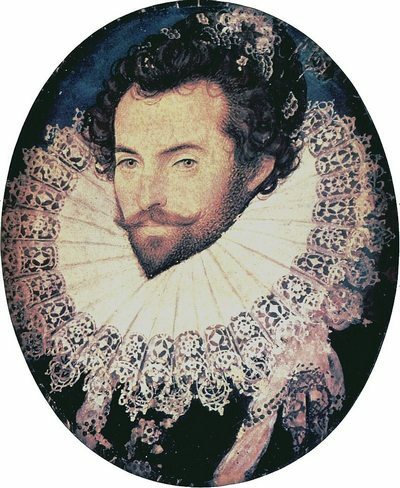 He painted his works mostly in water colour onto Velum which at the time was made from a prepared animal skin. The finished works were then stuck onto playing cards to strengthen them. 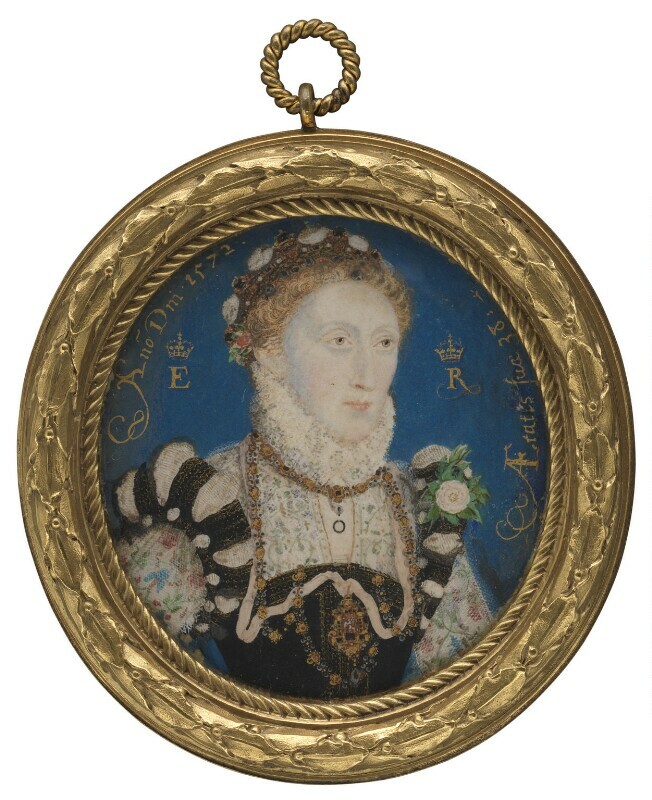 Elizabeth would give away these portraits without setting so the recipient would have to pay a lot of money just to get one made.